My wife absolutely loves this perfume that has a sweet, beautiful, scent and seems to go with every occasion. She will wear nothing else and I would not want her to wear anything else. Complement your young and fresh look with this eau de toilette spray. Yellow Diamond's zesty yet musky notes of lemon, bergamot, pear sorbet, orange blossom, and water lily take you from a bright sunny day at the office to an enjoyable night of margarita with friends. This took awhile to ship.. 9 days! HOWEVER it was kinda worth the wait. The 3.4 bottle is the same as what macys sell. Thank you OS for great price! Now my boo thang smells delicious. This is a floral kind of fragrance, and I love it. Unfortunately it didn't last very long, because it is an Eau de toilette. The perfumes last longer, but this does not come in a perfume spray. However, I have gotten some very positive comments when wearing it! 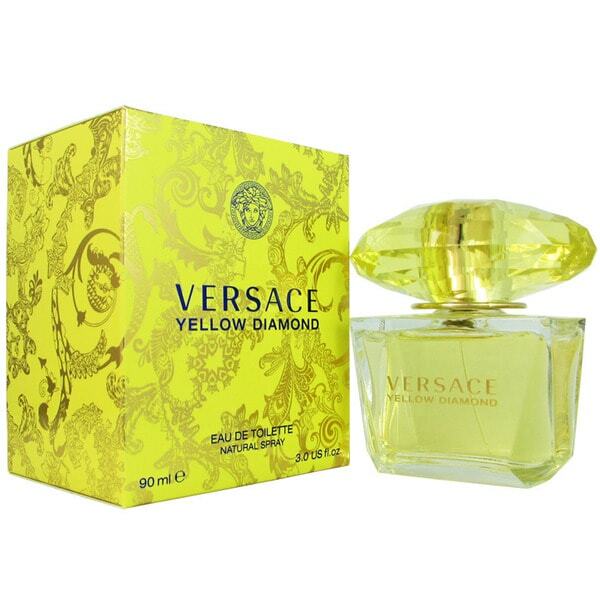 I love Versace Yellow Diamond. I have been buying it for years. Overstock has the best and I mean the best price for this product. It last all day and compliments your unique body chemistry which makes it unique to whomever is wearing it. I just absolutely love this perfume it is one of my favorites. I LOVE the way this smells. I receive numerous compliments when I wear this fragrance. (Especially from guys but women also). You will not be disappointed with this scent. I must try the Bright Crystals next because Yellow Diamonds is a winner!! Got this new perfume after smelling it on one of my clients. Could'nt resist the smell and bought it the very same day. It lasts very long even as an Eau de Toilette. Got lots of complements myself since I started wearing it and my husband is mesmerized by the smell. Another good find. In love! Love it will order again !!! The best! The wife likes this now at first she didn’t. I got a sample of this perfume for my wife and she really likes the way it smells. When the sample was gone she wanted to try and find it again, so I looked here for it and found it. This is the second bottle I have bought for her. It is a little pricey but she enjoys it. Nice fragrance, fresh and fun. It’s fresh and wonderful scent garnishes a lot of compliments when I wear it. Price is great. "What do you mean due to manufacture packaging, items cant be return, why would you change the packaging"
The toilette spray is in a box, but it is also sealed in a cellophane wrapping that is over the Versace box. I believe all perfumes and colognes sold by Overstock are non-returnable which is probably to protect the consumer. This is a great smelling fragrance if you are undecided. I get numerous compliments while wearing this. You can't go wrong with this scent! "are the perfumes on this site the real deal or knock offs"
Hello swindylou, please be assured that this product is completely authentic. Please let us know if you have additional questions. Thanks for shopping with us.